The funeral of PC Fiona Bone, who was killed in a gun and grenade attack, has taken place. 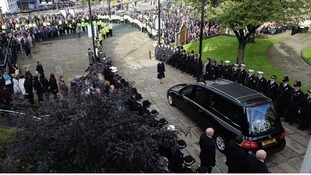 The funeral of her colleague PC Nicola Hughes - who died in the same attack - was held at Manchester Cathedral yesterday. PC Nicola Hughes was killed in Manchester in September. "The level of support shown to us as a family from both the people of Manchester and the public in general has been overwhelming and heart warming. “Greater Manchester Police have been extremely supportive in a sensitive and professional manner during the past four weeks and continue to be. “The amount of support shown in public and towards us in private by other police forces from around the country would have made Nicola immensely proud to have been part of this extended family. “Whilst we continue to grieve for our beautiful daughter and come to terms with our tragic loss, we would also like to take this opportunity to thank everyone who has paid tributes, sent cards and flowers or merely stood at the roadside and demonstrated dignity and respect towards Nicola. Police officer Fiona Bone was kind and gentle but also a "brave rock of a woman", mourners at her funeral heard today. Greater Manchester Police Chief Constable Sir Peter Fahy said PC Bone "set the highest standards" for herself and others. Hundreds of people gathered outside Manchester Cathedral to listen to his tribute. As the funeral cortege arrived at Manchester Cathedral there was spontaneous applause to the sound of a Scottish bagpiper. A large portrait photo of Pc Bone was carried into the cathedral, followed by her coffin, draped in black cloth and carried by six of her police colleagues. The coffin was taken in to Brahms's Herzlich Tut Mich Verlangen. The first hymn sung was The Lord's My Shepherd I'll Not Want. Bible readings were given by PC Bone's colleagues Inspector Jane Brown and PC Tracey Miskell. For more on this story visit ITV Granada. Thousands of mourners lined the streets of Manchester as the public paid their respects to PC Nicola Hughes who was shot while on duty.